Author Interview: Christine Wilson – Podcast #14 – Ms. Nena B. Writing a book is a very common dream but very few people step out on faith to do it. Christine Wilson decided to answer the call and write her story. Her new book “Authentically You – Following Your Own Path” is a powerful mix of realness and encouragement. In this interview, Christine shares what was the trigger to get her to start writing again and what your book publishing experiences were like. 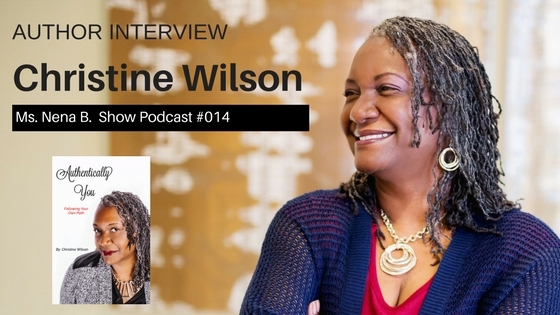 Listen to interview as Christine shares insights and words of wisdom. The book is available at Amazon.com or a signed copy at ChristineWilson.net. Thank you for listening. Don’t forget to LIKE and SHARE. Wonderful interview from such a sweet woman of God. Outstanding interview with a beautiful blessed woman of God! I have my signed autographed copy of my book. Outstanding!!! Five stars!Glory! I really enjoyed the interview, very helpful! Thanks,so happy i got to hear this show !